Borrowed wetsuit. Climbing in and zipping up. Even the ten-year-old is impressed with the super-hero get-up. 7:30pm, Monday. In the lake. 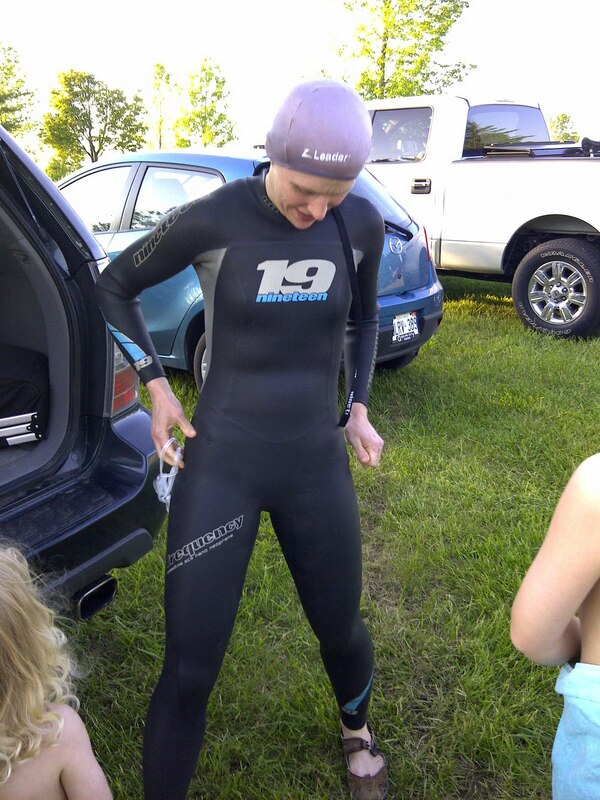 Taking the wetsuit for a spin. The water is mucky brown and thick with sediment. The sky and trees, perfect. 7:45, Monday. 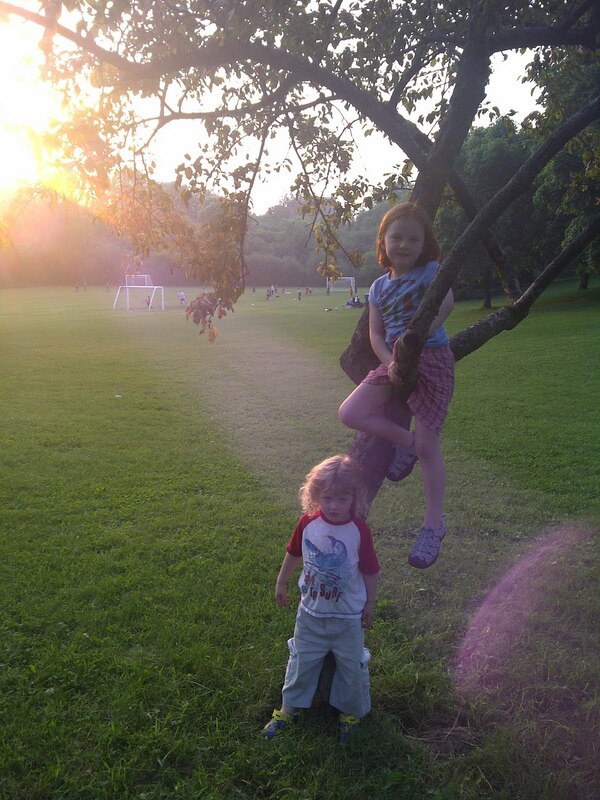 At the park for soccer practice. Glad it’s within biking distance. A tree she can climb. Mother reading on picnic blanket only wishes the mosquitos hadn’t found her and told all their friends. 8:15pm, Tuesday. 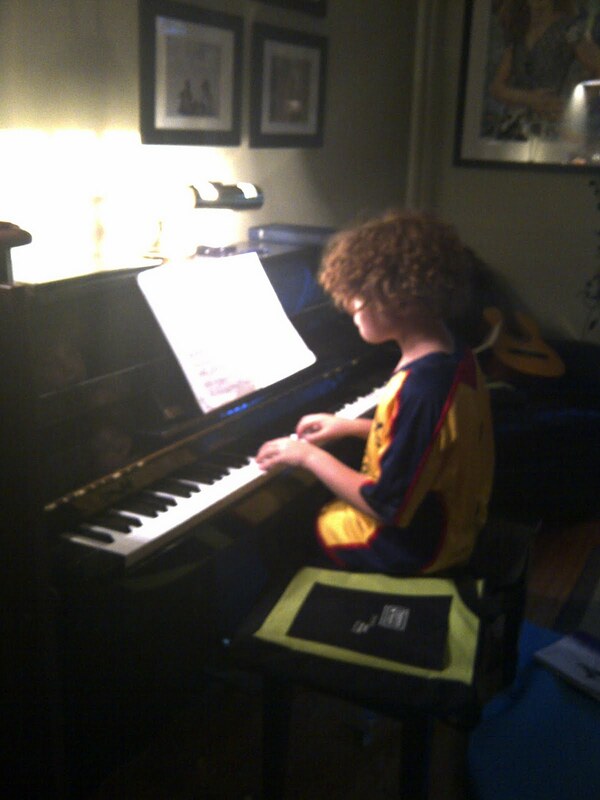 Piano plus soccer uniform = unplanned post-game down-time. He’s not practicing (lessons are over for the summer); he’s making music. 9pm, Tuesday. Long evenings are short-lived, in our portion of the hemisphere, and we are filling up the extra light with outdoor activities. Arriving home after 9pm with wide-awake children is taking a toll on my early morning training, and perhaps also on my midday thinking, but I’m going with the pull of the season. And the pull of older children with their own schedules and interests: soccer soccer and more soccer. 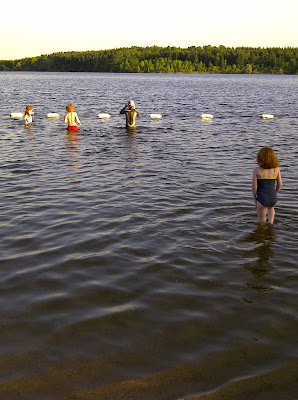 We plan to head back to the lake this evening, this time with friends and a picnic. 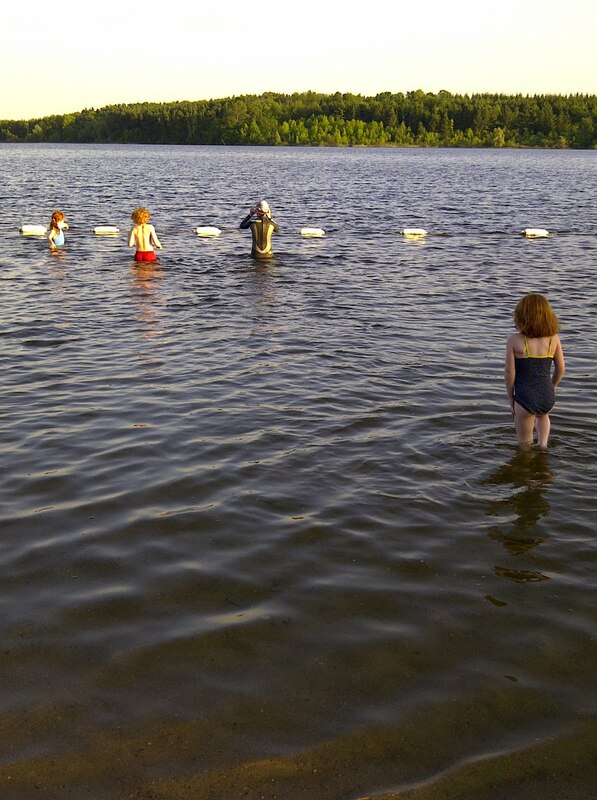 The kids can cool off in the water. And I hope to swim farther, this time, be braver, with an extra set of eyes on me. Race day is in less that two weeks: in the same lake pictured above. I read this post and immediately felt so calm and slowed-down, in a perfect summer way. Enjoy your picnic! I love this post, Carrie! And I have to admit, it’s been amazing and inspiring to witness your transformation into triathlete. Thank you, Sarah! I’m looking forward to cooling off on this hot day. Katie, you’ve been an inspiration to me, a triathlete long before it ever occurred to me that I could try, too.